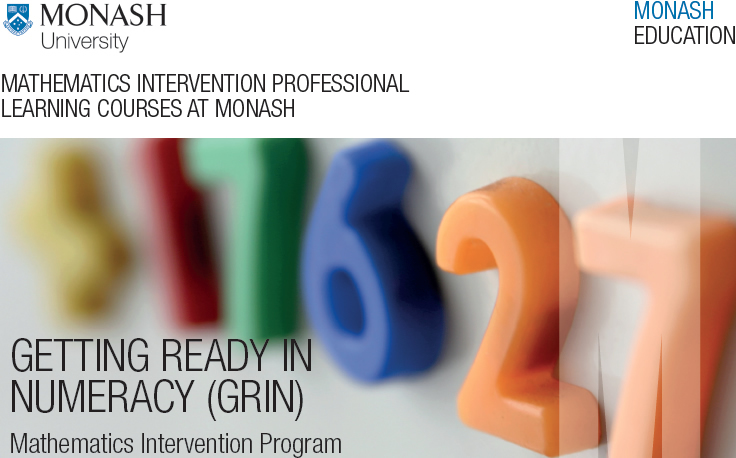 EMU is a research-based intervention program developed by Dr Ann Gervasoni of Monash University. It has been shown to improve children’s knowledge and confidence with mathematics. The program offers intensive learning opportunities for students who are experiencing difficulty in learning mathematics in the early years and beyond. Importantly it provides professional learning that offers individual or groups of teachers’ expertise and leadership in mathematical learning. Underpinning the program is an accreditation process that ensures that all involved maintain ongoing learning in this essential curriculum area and have the expertise to deliver professional learning to their colleagues, and work within a whole school approach to improving learning and teaching for all. For information about dates, venues and registrations please go to the Numeracy short courses. The program has three key components. This is a six-day program plus action research project for the school leadership team. This program educates specialist EMU teachers and involves field-based learning and a six-day spaced learning program. The field-based learning component involves teachers planning and implementing an EMU Program (5 x 45 minute sessions per week) throughout the year. The six-day program involves workshops, data analysis and reviewing video excerpts simulating ‘behind-the-screen sessions’. Professional interaction, critical reflection, associated discussion and professional reading are important aspects of the program. For successful course completion it is a requirement to participate in all 6 professional learning days, and to conduct the EMU Program daily throughout the year for a minimum of 10 weeks (25 hours), but ideally for 20 weeks or more. You must also complete two EMU Ongoing Professional Learning days annually to maintain the EMU Specialist Accreditation. In order to maintain EMU accreditation teachers who have completed the Specialist Teacher Course must participate in two days of professional learning each year. The EMU ongoing professional learning program is designed to ensure that all EMU-trained teachers maintain fidelity to implementation of EMU and interventions in their school setting. There will be two days of professional learning clearly designed to improve student outcomes and build EMU teacher/leader capacity. Participation in the ongoing professional learning program is essential to maintain accreditation.